I don't think they're actually wings, more like just tufts of fur that resemble wings. Then how can it fly? Hmm. I think it was more of just a high jump, a lot of other pokemon have done stuff like that to get a better shot at hitting their opponent in the anime. It never seemed to have flap it's wings at all and I think the reason why it didn't get flying type even if they are usable wings, is because it doesn't seem to learn flying moves anyways. Just my theory on that though I guess. Absolutely does appear around the time of disasters so maybe this is just signifying that more? It looks like it could be a perfect title for a Pokémon novel about the Mega Absol! I love its Mega Evolution! I know right! It's completely amazing! It managed to be an evolution even cooler than the original Absol, which ain't exactly an easy thing to do. So smooth and atmospheric. Absol has a great presence here. My most fravoritus baby ever! Awesome job!! Not a problem. Did my baby so good! She (i'm assuminy it's a girl) looks really proud. Nice. Wow, I really love the pose, the lighting, even the pillar it's standing on.. so great! Thanks for sharing! Fav'd! best depiction of mega absol yet. I LOVE LOVE ABSOL and this is awesome! its my 2nd favorite Pokemon! (my favorite is Luxray) so awesome! awesome! 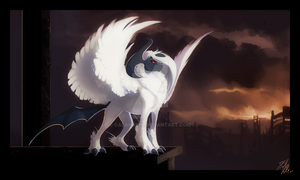 I love absol and this is a nice pic! Thank you!! Glad you like it!!! But thank you for informing me! !